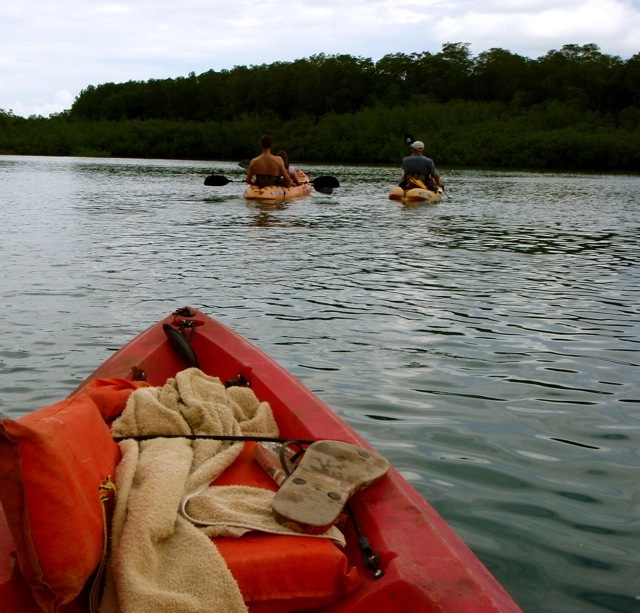 Kayak tours are offered around Puerto Jimenez and Cabo Matapalo. You will be kayaking with an experienced instructor, and you’ll learn how to kayak and be advised about safety instructions before heading out for your kayak trip! There are several different kayak tours available, and you can decide to combine certain tours or just do one at a time. 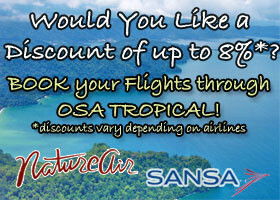 On this tour you’ll be taken around the beautiful coast of Cabo Matapalo. This tour depends on the swell and waves. This is a tide dependent tour and the departure time changes on a daily basis. Our recommendation is to try to do it the days when the tour is either in the morning or in the afternoon. The Mangrove Kayak tour takes three hours. 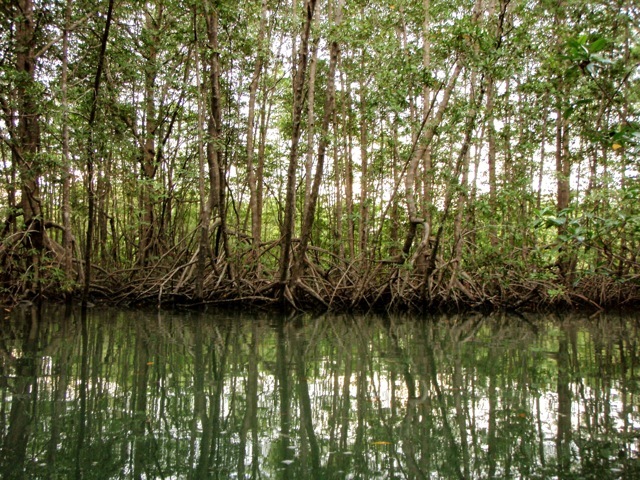 First you’ll kayak to the mangroves and up to certain point in the river where you come back the same way. After a while you get to a spot where you cross from the mangrove to the gulf/ocean. You’ll spend some time bathing at the beach and eat a piece of fruit, then you’ll turn back and do a nice loop around the coastline. 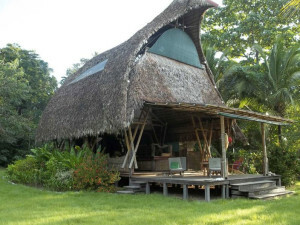 The costs are $45.00 per person for 3 hours. On this Kayak trip you’ll kayak around the gulf, trying to find a good spot to watch the sun set. 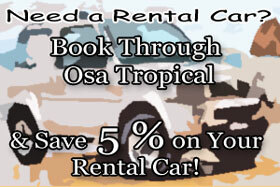 This tour guarantees you great picture opportunities and lots of relaxation. There is a great chance of watching dolphins on the way. The tour takes 3 hours and the cost is $45.00 per person. 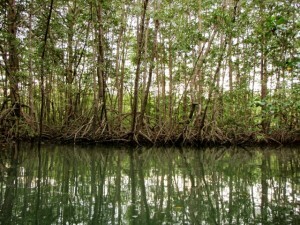 Kayak and Mangrove Tour with visit to a Wildlife Refuge. This tour takes around 3 hours and costs range from $45 – $50 per person, depending on the group size. Birdwatching Kayak-Tour. This tour takes around 3 hours and costs $45 per person. 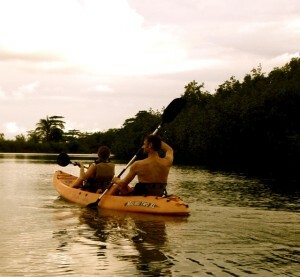 Kayaking around the Golfo Dulce. This tour takes around 3 hours and costs $45 per person. Kayak- Fishing. This tour takes around 4 – 5 hours and costs $75 per person. Kayaking combined with a bike riding trip. For this tour we need a minimum of 2 people, and costs are $45 per person. Kayaking combined with a bike riding trip and a visit to the Wildlife Refuge. For this tour we need a minimum of 2 people and the costs are $75 per person. More advanced bike riding and kayaking tour. For this tour we need a minimum of 2 people and costs are $80 per person. Outrigger Floating Tour. For this tour we need a minimum of 4 people and costs are $25 per person.